By Daniel Horowitz-- United Jewish Appeal Campaign 2012, chaired by Barbara Bank and Gilbert Palter, kicked off officially on August 23rd at Toronto’s Sony centre with a record-breaking crowd of 2,000 UJA supporters, who were entertained by Jason Alexander of Seinfeld fame. The huge crowd in attendance turned out to be a harbinger of good things to come for the Campaign, and for Jewish Toronto, which held its closing celebration on February 8. 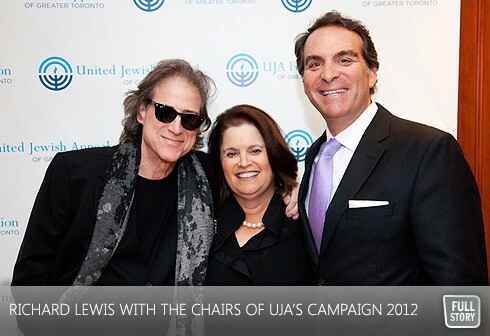 “If there is one thing I learned this year, it is that the high quality of Jewish life that we all enjoy in Toronto exists largely because of the strength of our annual UJA Campaign,” Palter told the more than 700 UJA supporters at the Closing, held at Toronto’s Events on the Park, and featuring comic and actor, Richard Lewis. As of February 26th, Campaign 2012 has raised $51,054,944 in unrestricted gifts. UJA has raised an additional $3.1 million in designated gifts, over and above donors’ unrestricted gifts. In total, together through the UJA annual campaign we have raised $54,153,121. Lewis, recognized as one of the top 50 comedians of all time, has been entertaining audiences for more than four decades with his unique brand of neurotic comedy. An accomplished actor with several TV and film credits to his name, is currently one of the stars of HBO’s hit show Curb Your Enthusiasm. After his stand-up routine, Lewish took questions from the enthusiastic crowd. The incoming chairs of UJA’s Campaign 2013, Sarena Koschitzky, Bruce Leboff and the chair of Women’s Philanthropy, Laurie Sheff, were also introduced at the Closing.